Although we visibly run one mile to honor and remember each fallen hero from the current conflicts, the total run represents every service member from New Jersey who laid down their lives for freedoms cause. Thousands have sacrificed to preserve our way of life and as you give tribute to a particular hero please remember others who have given the ultimate sacrifice throughout history. New Jersey being rich in the foundation of this country has given 16,408 of her sons and daughters. Regardless of war or conflict, branch of service or method of death, we ultimately run for them all, honoring their service and sacrifice, and remembering that they each gave up a future so that we could have ours. We give tribute to them by name wherever possible and to the sacrifice of the families they left behind. 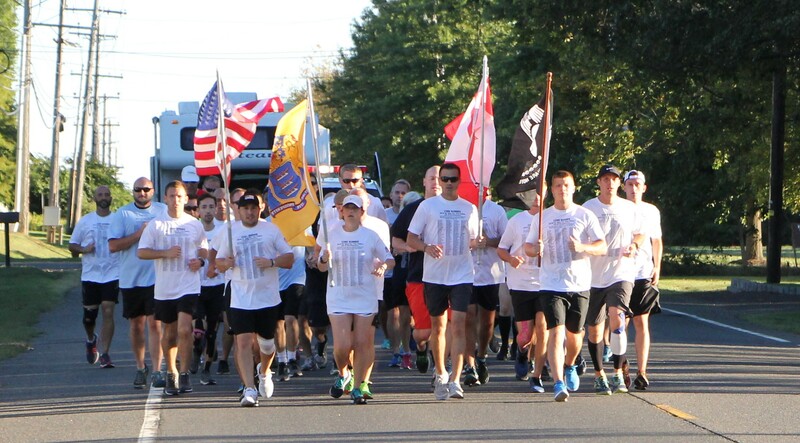 “The New Jersey Run for the Fallen is an organization of military runners and support crew whose mission is clear and simple: To run one mile for each New Jersey service member who have died during the GWOT (Global War on Terror). Each mile of sweat and pain and each flag saluted, is to pay homage to one service member’s life and their family. The last Thursday, Friday, Saturday and Sunday of September, we run across New Jersey to raise awareness of the lives of those who have died, to rejuvenate their memories and keep their spirits alive, to support organizations that aid the families of those killed, and to aid in the healing process for the native New Jersey residents whose lives have been affected by the war.